Elsie E. DiGregorio, 95, of Mason City, died on Sunday, January 27, 2019 at Muse Norris Hospice Inpatient Unit in Mason City with her family by her side. Services will be at a later date. Inurnment will be at Elmwood-St. Joseph’s Cemetery. Memorials may be sent to Hospice of North Iowa or Epiphany Parish. 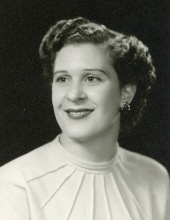 Elsie was born in Mason City, on February 9, 1923 to Frank and Maria (Baccnale) DiGregorio. She was the 6th of 8 children. Elsie worked as a laborer for Jacob E. Decker & Sons Meat Packing Plant for 50 years until her retirement. In her free time, Elsie loved to garden and enjoyed traveling the world. Elsie is survived by her sister, Eda Godges; and many nieces and nephews. To send flowers or a remembrance gift to the family of Elsie E. DiGregorio, please visit our Tribute Store. "Email Address" would like to share the life celebration of Elsie E. DiGregorio. Click on the "link" to go to share a favorite memory or leave a condolence message for the family.